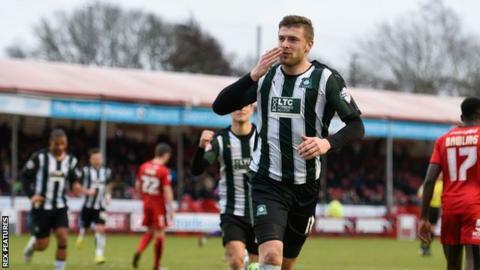 Plymouth remain second in League Two despite conceding a late equaliser away at Crawley. The away side dominated the first half but home keeper Paul Jones parried Gregg Wylde's driven effort. Ryan Brunt headed in Wylde's cross for his 10th goal of the season to give Argyle a deserved lead midway through the second half. With less than 10 minutes left substitute Shamir Fenelon poked in from close range to earn Crawley a point. "Being a goal down against a team who've won nine out of their last 13 away games, you fear the worst, but we stuck at it. We showed resolve and I think we got a deserved equaliser. "It shows the players believe in themselves and they have a good spirit. We had to dig in and I said we were disappointed with the goal. To recover from that, we didn't come apart and concede another one. "I thought Tom Dallison did exactly what I thought he would do. He was aggressive, strong and he's got real leadership qualities for a 19-year-old. He can really be pleased with his debut." Match ends, Crawley Town 1, Plymouth Argyle 1. Second Half ends, Crawley Town 1, Plymouth Argyle 1. Attempt missed. Carl McHugh (Plymouth Argyle) left footed shot from outside the box is just a bit too high. Foul by Gavin Tomlin (Crawley Town). Goal! Crawley Town 1, Plymouth Argyle 1. Shamir Fenelon (Crawley Town) right footed shot from very close range to the centre of the goal. Assisted by Josh Yorwerth. Foul by Jordan Forster (Plymouth Argyle). Roarie Deacon (Crawley Town) wins a free kick on the left wing. Attempt missed. Jordan Forster (Plymouth Argyle) left footed shot from outside the box is close, but misses to the left. Corner, Plymouth Argyle. Conceded by Paul Jones. Graham Carey (Plymouth Argyle) wins a free kick in the attacking half. Substitution, Plymouth Argyle. Jake Jervis replaces Ryan Brunt. Gavin Tomlin (Crawley Town) is shown the yellow card for a bad foul. Curtis Nelson (Plymouth Argyle) wins a free kick in the defensive half. Gavin Tomlin (Crawley Town) wins a free kick in the attacking half. Attempt missed. Gavin Tomlin (Crawley Town) left footed shot from the left side of the box misses to the left. Foul by Curtis Nelson (Plymouth Argyle). Shamir Fenelon (Crawley Town) wins a free kick in the attacking half. Curtis Nelson (Plymouth Argyle) wins a free kick in the attacking half. Foul by Lee Barnard (Crawley Town). Attempt missed. Ryan Brunt (Plymouth Argyle) right footed shot from outside the box misses to the left. Attempt missed. Sonny Bradley (Crawley Town) left footed shot from the left side of the box is high and wide to the left. Attempt missed. Graham Carey (Plymouth Argyle) left footed shot from outside the box is close, but misses to the right from a direct free kick. Ryan Brunt (Plymouth Argyle) wins a free kick in the defensive half. Foul by Tom Dallison (Crawley Town). Substitution, Crawley Town. Shamir Fenelon replaces Chris Atkinson. Attempt missed. Graham Carey (Plymouth Argyle) left footed shot from outside the box is high and wide to the left. Corner, Plymouth Argyle. Conceded by Sonny Bradley. Jordan Forster (Plymouth Argyle) wins a free kick in the attacking half. Attempt saved. Gwion Edwards (Crawley Town) right footed shot from outside the box is saved in the centre of the goal. Jordan Forster (Plymouth Argyle) is shown the yellow card for a bad foul.